Cross-posted from the Red Hat Services blog, here. A key part of the Red Hat® product portfolio, Red Hat JBoss® Middleware makes things that should work, actually work. Everything from business processes and business rules management, helps your business run smoothly so you don’t have to sweat the small stuff. 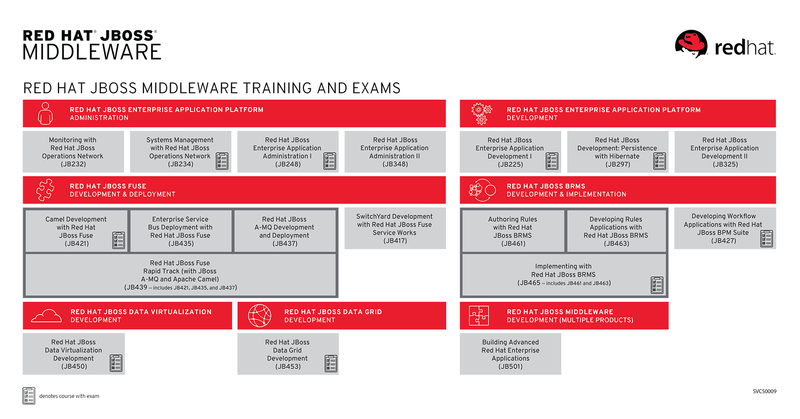 For Red Hat Training and Certification, JBoss is a crucial branch for courses and exams, equipping IT professionals with skills to accelerate, integrate, and automate. When it comes to automation, Red Hat JBoss BRMS and Red Hat JBoss BPM suite are the way to go. What Are JBoss BRMS and BPM Suite? Deploy decision services across physical, virtual, and cloud environments. Make consistent and efficient decisions. Quickly build resource optimization solutions. Shorten development cycles for faster time to market. Business process management (BPM) and business rules management (BRM) systems help business and IT users collaborate to manage business logic and quickly modify procedures and policies as needed. Developing Workflow Applications with Red Hat JBoss BPM Suite (JB427) to incorporate workflow processing in business applications. Authoring Rules with Red Hat JBoss BRMS (JB461) to to author and test rules using the graphical user interface of Business Central. Developing Rules Applications with Red Hat JBoss BRMS (JB463) to create, test, debug, and control business rules in a production environment. Red Hat Training has released these three courses in the latest way to train, Video Classroom. It’s a self-pace, on-the-go way to train, making it easier for IT professionals to get trained without the hassle of leaving the datacenter, having to pay for travel expenses, and without having to take time off work. If you are interested in exploring more than one course within the JBoss Middleware curriculum, consider purchasing the Red Hat Learning Subscription. Easy access for individual’s to all of Red Hat Training’s online and video classroom courses in one nice training package. Take your company, your team, or your work to the next level with these training courses today. Not sure where you rank with your JBoss skills? Take this skills assessment. Want to see all our JBoss Middleware curriculum? Download this infographic.